Smooth-On MT-13® is a premium performance epoxy for applications requiring maximum holding power and water resistance. 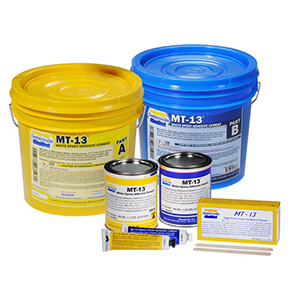 MT-13® is a two component epoxy adhesive cement which is mixed in equal parts by volume (100A/123B by weight) Pot Life is 35 minutes and handling strength develops in 16 hours at 73° F / 23° C. MT-13® adheres extremely well to both porous and non-porous surfaces. MT-13® is widely used by the boating industry for assembly and general repair. MT-13® also maintains holding power under extreme cold conditions. MT13 Cola epoxi / 142 gr. Cola epoxi de dos componentes. Unidad 142 gr. Safety - Use in a properly ventilated area (“room size” ventilation). Wear safety glasses, long sleeves and rubber gloves to minimize contamination risk. A clean, dry surface is a necessary prerequisite for adhesive bonding. Adhesives will stick to either the surface of which a bond is desired or to that film of extraneous material directly on that surface. Rarely can a structural adhesive penetrate through surface contaminants to provide an optimum bond on an unclean surface. Porous materials are simple to bond, provided they are dry. The surface should be sanded till clean and free from dust. Nonporous surfaces, such as found on metal and plastic materials, should be degreased, dried and roughened by sanding, sandblasting or chemical etching. The etched or sandblasted surfaces should be covered within a few hours of treatment to prevent contamination. Epoxy adhesives do not perform well on metals such as nickel, chromium, tin or zinc nor on soft thermoplastics like polyethylene. Refer to the Preparation of Surfaces for Adhesive Bonding technical bulletin. Measure equal amounts of Parts A and B (or 100A:123B by weight) and mix thoroughly for 3 minutes to a uniform color (no streaks). Apply to prepared surface at a thickness of 1/32” - 1/16” (0.08cm - 0.16cm). Fit other surface over epoxy and apply even pressure using clamps or weights until material cures. MT-13® will cure and reach handling strength in 16 hours at room temp. (73°F/23°C). Applying uniform mild heat will cure epoxy faster–150°F/65°C for 4 hours. Let cool to room temperature before moving bonded substrates. 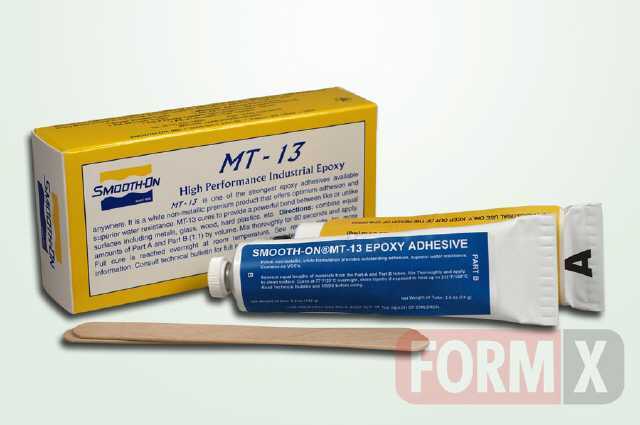 Smooth-On MT-13 ® es un adhesivo epoxi de rendimiento superior. Se utiliza en aplicaciones que requieren la máxima fuerza de sujeción y la máxima resistencia al agua. MT-13 es un cemento adhesivo epoxi bicomponente que se mezcla en partes iguales por volumen o en peso 100gr.A +123gr.B en unas pocas horas se convierte en un gel. Tiene un curado de 16 horas y se adhiere muy bien a las superficies porosas y no porosas. MT-13 se utiliza en la industria de la navegación para el montaje y para realizar reparaciónes. Permítanos ayudarle a encontrar lo que busca. La lista a continuación puede ayudarle a encontrar lo que está buscando a través de una ruta alternativa.